Knowing how to properly manage money is important, yet a good majority of adults don’t have a budget plan. In fact, only 41% of Americans have a budget, meaning that almost 60% of the country doesn’t keep close tabs on their finances. While budgeting may not be the sexiest part of being an adult, it’s a necessity if you want to have a clear understanding of how much money you make and where your money is being spent. Having a budget is beneficial in that it gives you control over your money and keeps you focused on achieving your financial goals. It can even help you get out of debt. Here’s everything you need to know about creating a budgeting plan. The first step in creating a budgeting plan is determining how much you make each month. By knowing how much money you bring in each month, you can ensure you have enough to cover your costs with enough left over for other financial goals, such as building an emergency fund or putting more money into your savings account. When calculating income, always look at your post-tax and payroll deduction total. While your annual salary may be $60,000, you likely don’t make $5,000 a month, especially after taxes. By knowing exactly how much you have coming in each month, you can determine how much you can afford to spend. What’s good about fixed expenses is that they’re easy to budget for. Even better is the fact that you can often negotiate a lower rate from the service provider or lender. On the other hand are variable expenses. These are expenses that change from month to month, including utilities, grocery costs, clothing, and entertainment. You have a lot more control over variable expenses and can lower them as needed, especially as you solidify your budget. In the ideal world, your income should far exceed your expenses. However, we all know this isn’t the case for many people, especially those who live paycheck to paycheck. An effective budgeting strategy is zero-dollar budgeting. This involves assigning every dollar you make to go towards a specific purpose. 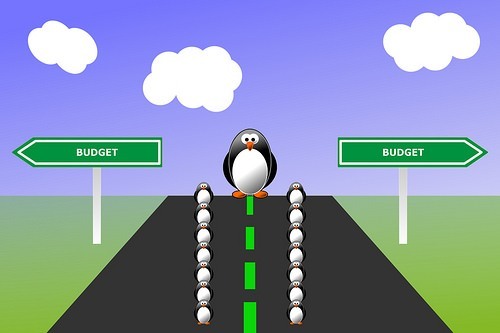 From your rent or mortgage to your car payment to your savings account, zero-dollar budgeting gives you a clear path as to where your money is going and mostly importantly, why. If you have money left over after creating your zero-dollar budget, be sure to reward yourself. Put money into your savings account or an investment account – pay yourself first! If you’re lacking money after creating a budget, now’s the time to find ways to boost your income. Creating a budget is an accomplished goal in itself, but once you have a better handle on your finances, it helps to create goals. Maybe you want to be debt-free in the next five years. Maybe you want to buy a new car. Or maybe you need to improve your credit so that you can get approved for a mortgage. Whatever your financial goals may be, write them down and find ways to incorporate them into your budget. For example, let’s say you want to pay off a high interest loan. To start, you could lower your variable expenses by cooking at home or shopping less often, which keeps more money in your bank account. From there you can put that extra money towards your debt, allowing you to pay well over the minimum so that more of your money goes towards the actual balance owed and not interest. As you start to reach your financial goals, set more of them, and don’t forget to reward yourself along the way. With a budget and goals all figured out, the next step is to keep track of your expenses. To make this a painless process, download a mobile app like Wallet, PocketGuard, or Clarity Money. These apps not only track where you’re spending your money, they also tell you when you’re coming close to going over your budget. Many of the apps also allow you to set short and long-term financial goals so that you have something to work towards. Budgeting apps are also beneficial in that they let you visualize where your money is going. This can be a big eye opener for people who tend to spend more than they should. Creating a budget isn’t the most fun part of life, but it’s for sure a necessity. Follow these steps and you’ll be well on your way to financial security and clarity. If you have any helpful advice for setting up a budget, leave a comment and share your best tips in the section below. The only thing I would question here is this. I have lived on a budget my whole adult life. I have never had debt. Credit card, House payments, car payments, loans. The way I was taught was you take 10 percent right off the top. Or whatever amount and it gets saved. Then you budget the rest. You learn to live without that 10 percent. If you do this from the get go you never miss the money. I was always taught also that if you got a raise you didn’t increase your lifestyle or take on a payment. That goes away right away before you get used to spending it. I adjust my budget everyday if need be. Things go up. If you budget a certain amount for electric and it goes up in price you don’t save less you decrease an expense somewhere else that month or for good. This is how I know how much value money has lost over the years. I make more than ever and my lifestyle has gone down. I moved from a 6000 dollar a year tax wise neighborhood to a 900 dollar a year neighborhood. I have done this my whole life to stay within the confines of a budget. I fix my cars. 1300 dollar a year in repairs is still light years from a 400 dollar per month payment at 5 percent interest. Of course if you have a goal to climb out of debt then your budget will look different but it has the same type of principle. You’re a natural budgeter Tim. This article is for people who can’t/don’t budget. But all your advice is spot on, and I’d even say downright old school. You didn’t have to tell people to live beneath their means and save money 50 years ago. With WW2 and the Great Depression still fresh on people’s minds, budgeting and saving was part of surviving. That certainly was true for my parents and grandparents. None live high, but they always had savings to back them up. It’s amazing how just a few thousand dollars can change your whole outlook on life. As a friend of mine said way back when “when the vault is full, you’re view of life is very different than when it’s empty”. I say AMEN to that. While certainly not the sexiest topic, understanding your budget is fundamental to financial survival. That 60% of Americans don’t know where they stand is appalling. Your insightful and concise stop-by-step description should be of great help to all readers. It’s a great reminder to everyone to focus on the basics. Maybe your “Public Service” will inspire others to focus on how to achieve their goals by realistically facing their current situation. I know I’m inspired! Many thanks. Hi Ian – Gary Wilkinson is the brain trust behind the ideas, I’m just the host. But it really is sad that budgeting is something people need to be told about. If more people learned to simply save regularly, that would force a budget to happen. I like Tim’s idea of 10%. Most people could do that without experiencing denial. Plus the accumulation of savings would create a greater sense of security and certainty. I think that’s the part so many miss. But on the other hand, with the cost of living being so high, and the ability of the bottom 90% to earn a living so constrained, none of this is surprising either. I understand. This is my expertise. I can fix anybodies budget. I have done it with guys I used to work with. Sometimes it requires a huge amount of pain but it can be done with any income. If I made 700 dollars a month I could still do it. 70 to savings. That leaves me 680. I would rent a room for 20 dollars a week if I had too.City bus pass is 50 per month. You get the idea. If that wouldn’t be enough for you to change your life than your hopeless. One of my brothers-in-law is like that, he keeps a book where he records every expense. He also spends almost entirely cash, I don’t think he ever had a credit card. What I’ve found too is that people who can live on very little are usually happier than most others. I think being able to live on next to nothing is very liberating, in a way the high income/high cost of living lifestyle can never be. I had an uncle who died in 2014. He worked as a church custodian throughout his life. I don’t think he ever made as much as $30,000 in his life. Yet when he died in at age 75, he had something like $120,000 in savings and investments. He lived one step above a homeless person, and you’d never guess he had that kind of money. But that’s like a junior version of the Millionaire Next Door. The people who have the real money never flaunt it. In another example I had an accounting client decades ago who was worth several million dollars way back then. Stocks, bonds, real estate mostly. He owned a farm and garden store, lived in a modest home, had zero debt, only drank coffee from the coffee maker at work (no Starbucks for him) and even brown bagged his lunch. As his accountant I knew what he was worth. But anyone seeing him on the street might have mistaken him for a working class guy, maybe even working poor. In my opinion that’s the smart money. They have it, but it doesn’t define or control their lives. This is a topic I need to write about. In the ostentatious world we live in, having money, but not flaunting it, is a true virtue. And I’d add, a better way to live in general. I differ in that I do have a credit card. Paid in full every month. I use the points to travel which I do quite a bit for free. I haven’t paid for a plane ticket or hotel in years. The other thing I would add is that sometimes their are expenses that occur once or twice a year. I have an account just for this. I put monthly into that so when I get a property tax bill I just pay it from that account. Of course I have a spreadsheet for that also. I break down the payment in 12 monthly installments plus 5 percent in case of it rising. So if it’s 1000 per year it’s 83.33 per month so I’ll round it to hundred. Another trick is rounding up. So if you budget say 45.00 per month and the bill is 42.50 I actually put that 2.50 into my savings. I know it sounds stupid but if you round up on eight or nine fixed expenses it could be 40 or 50 dollars a month in just found money already spoken for. It’s not stupid at all Tim. There are apps out there, like Acorns, that do exactly that. They call them Round-ups. You by something for $4.25, they take $5 out of your account, pay the $4.25 then move .75 into savings. It’s a brilliant strategy for people who can’t save money otherwise. They save money while the do their normal spending.